Any number of operations can benefit from the strength and durability of Easy Rack Steel Ladders. School maintenance crews can use them for quick access to problem areas to prevent a number of problematics from interrupting the educational process. Homeowners can use smaller steel ladders for extra weight capacity and more convenient storage options in limited space. Warehouses can use almost any steel ladder for both material handling needs and shipping and receiving process flows. Steel is the strongest, most cost effective material metal for the strength it represents. As such, steel ladders can weather wear and tear more effectively than ladders made from lighter metals, and they can also provide a much more stable platform for material handling due to their ability to support greater weight capacity without slipping or buckling. 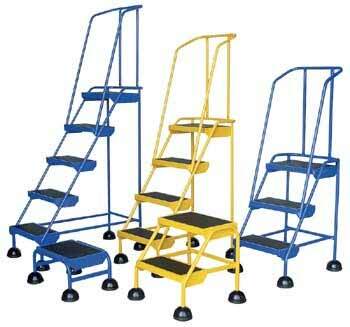 Any storage facility can improve both safety and efficiency with steel ladders. Because steel remains firm under greater amounts of pressure, steel ladders offer a secure platform upon which a person can ascend or descend without losing balance due to ladder sway. Steel ladders provide easy and safe access to products on high shelves. Any number of Steel Rolling Ladders found in Easy Rack?s online warehouse could safely support both a human?s weight and the weight of products and supplies being vertically moved along the ladder. Smaller steel stepladders are a favorite for school district and apartment complex maintenance crews who are responsible for everything from changing light bulbs to working on overhead light fixtures and plumbing. Loading docks are relying more and more upon steel ladders and certain key features they offer to crews loading and unloading trucks during both daytime and nighttime hours. The benefits Easy Rack offers with its many steel ladder designs derive directly from key features innate to each particular ladder design. Steel rolling ladders are built for multifunctionality and safety foremost in mind. Each model features an exclusive, lockable safety gate that prevents access by children and unauthorized personnel. Pushing the gate forward will raise the casters off the floor and allow for safe ladder access. This also locks the ladder into place so it will not slip under content pressure. With a 350-pound load capacity, Easy Rack rolling steel ladders can support a worker and any carried supplies. When a worker no longer needs the ladder, pulling the safety gate backward will lower the casters to the floor and allow the ladder to be moved. Other steel ladders by Easy Rack offer specific improvements to efficiency, material handling, and material storage in a number of unexpected, but nonetheless essential, environments. Docks are excellent examples of this type of area. Characterized by heavy vehicle and pedestrian traffic during all hours of the day and night, they can be incredibly accident prone in terms of inadvertent collisions between trucks and equipment. Aluminum ladders often do not do too well in docks for obvious reasons. By the same token, though, docks benefit from the additional safety features that Easy Rack Walk-Thru Ladders deliver to their shipping and receiving personnel. Even in the best of light, workers on the night crew can easily misjudge distance and injure themselves or valuable products with and inadvertent collision with a standard ladder. Walk-Thru steel ladders solve this problem by providing a secondary passage space between the ladder base and the wall. The ladder mounts to the dock face either by welding or bolting. Workers moving up and down on the ladder can maintain better balance with the extra high handrails these steel ladders feature. Every Walk-Thru Dock ladder projects 8 ?? from the face of the dock and gives employees plenty of room to navigate without a collision. All Easy Rack ladders feature a powder coat finish that helps better protect them against both collision and natural material degradation. Their ability to endure impact makes them far more reliable in smaller warehouses than aluminum ladders that can suffer significant damage or scarring from accidental collisions. Please read more about the different types of steel ladders Easy Rack carries, and feel free to call us to obtain more product specifics and practical suggestions on how to use them to reduce overhead and improve safety reporting specifics that could in turn work in favor of obtaining better commercial insurance premiums. Call Us @ 1-888-776-3720 to talk to a material handling expert and a free quote.